Hey Everyone, I know this is probably a busy week for you all, and maybe taking photos is the last thing on your mind with all the clean up we've been doing since Christmas. 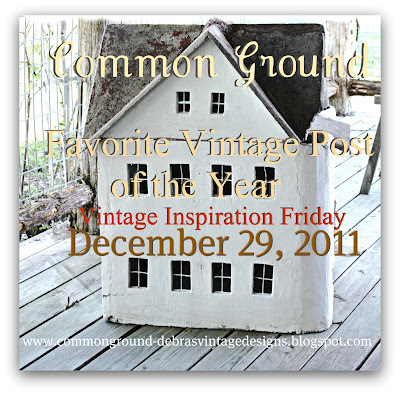 I thought that we could recap the year with our favorite "vintage" posts of 2011. Pick one or two that are your faves or that you enjoyed sharing, and let's all get together Thursday December 29 thru the weekend. Hope you have a Healthy & Happy New Year ! ! I'm just looking at all my Christmasing and thinking about taking it down, but I haven't done a thing yet! Take care and i hope you had a wonderful Christmas. I'm so glad I found your lovely blog. This will be a place I will come back to more and more, I guess. Just beautiful house! Great idea! Enjoy your cleaning up time! Great idea Debra. I was out of town for a few days and now have to play catch up with all the Christmas stuff to put away. It's difficult to find the time to post with visitors here too. This should be fun! I love it Debra. I'll be here. I'm in clean up mode too. Have a happy New Year, dear friend!